Earth Day April 22 nd Week 8 – The Environment and Debating. 2 In your opinion, which picture is the most disturbing? Why? Share your opinions with a partner. 3 Earth Day Every April 22 nd. 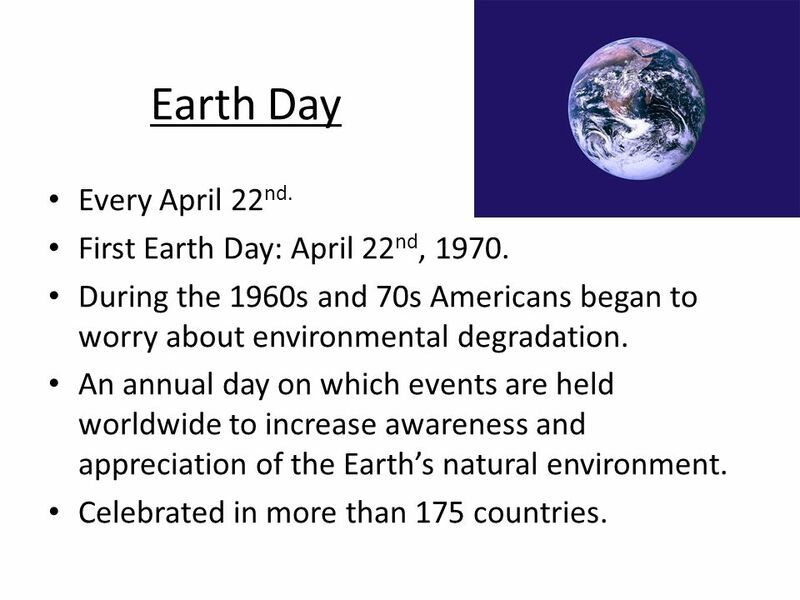 First Earth Day: April 22 nd, 1970. During the 1960s and 70s Americans began to worry about environmental degradation. An annual day on which events are held worldwide to increase awareness and appreciation of the Earths natural environment. Celebrated in more than 175 countries. 6 1. 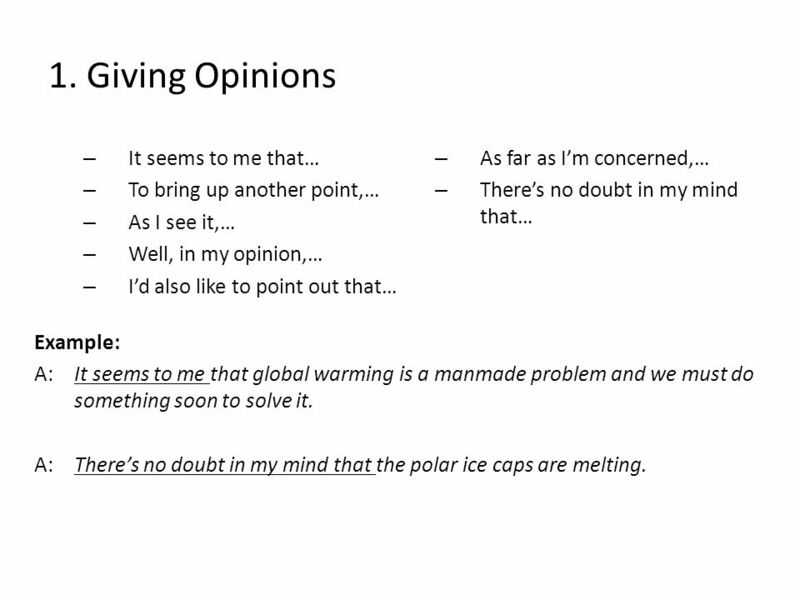 Giving Opinions – It seems to me that… – To bring up another point,… – As I see it,… – Well, in my opinion,… – Id also like to point out that… – As far as Im concerned,… – Theres no doubt in my mind that… Example: A:It seems to me that global warming is a manmade problem and we must do something soon to solve it. A:Theres no doubt in my mind that the polar ice caps are melting. 7 2. 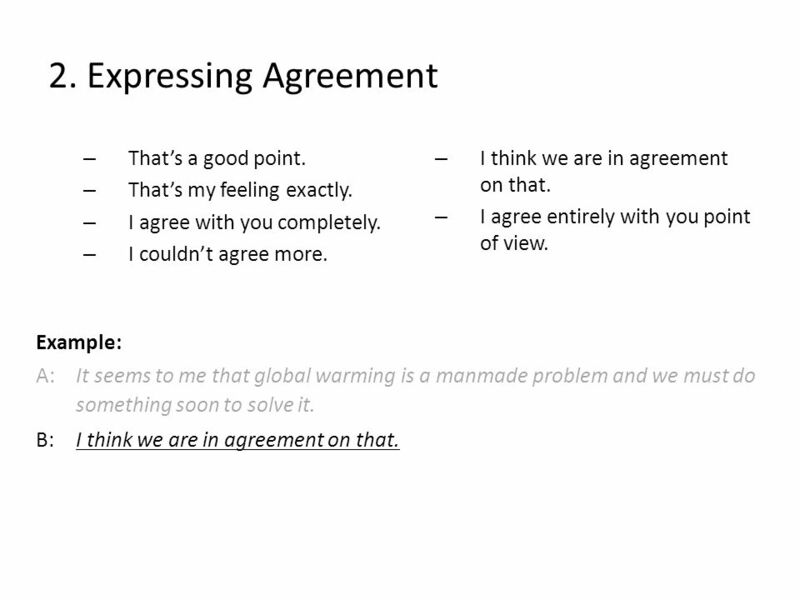 Expressing Agreement – Thats a good point. – Thats my feeling exactly. – I agree with you completely. – I couldnt agree more. – I think we are in agreement on that. – I agree entirely with you point of view. 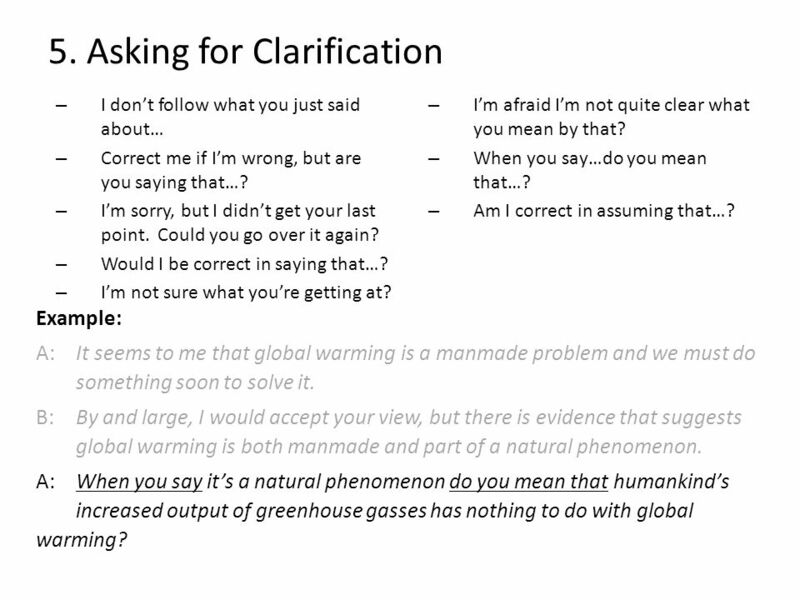 Example: A: It seems to me that global warming is a manmade problem and we must do something soon to solve it. B: I think we are in agreement on that. 8 3. 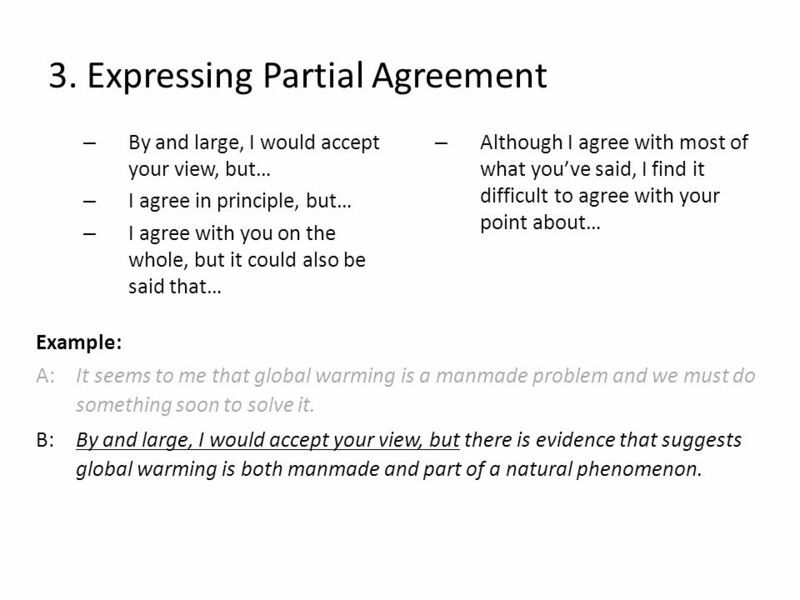 Expressing Partial Agreement – By and large, I would accept your view, but… – I agree in principle, but… – I agree with you on the whole, but it could also be said that… – Although I agree with most of what youve said, I find it difficult to agree with your point about… Example: A: It seems to me that global warming is a manmade problem and we must do something soon to solve it. B: By and large, I would accept your view, but there is evidence that suggests global warming is both manmade and part of a natural phenomenon. 9 4. 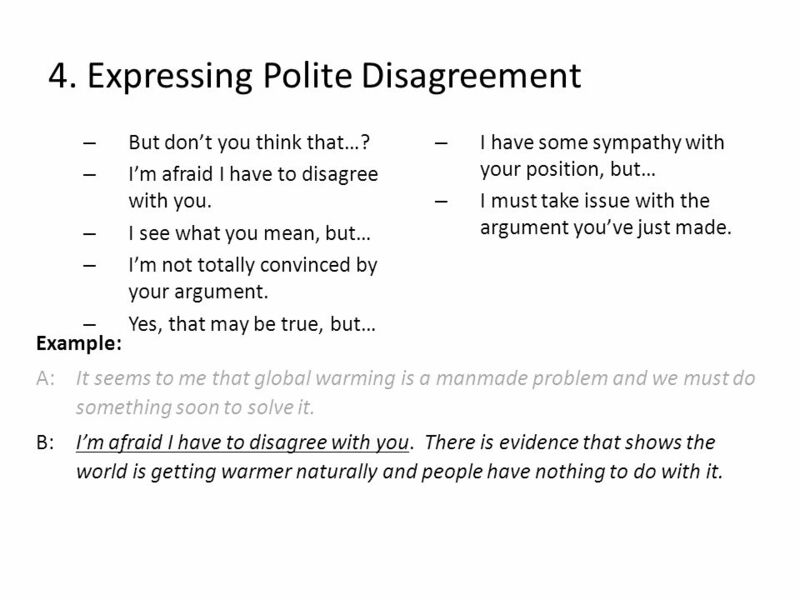 Expressing Polite Disagreement – But dont you think that…? – Im afraid I have to disagree with you. – I see what you mean, but… – Im not totally convinced by your argument. – Yes, that may be true, but… – I have some sympathy with your position, but… – I must take issue with the argument youve just made. 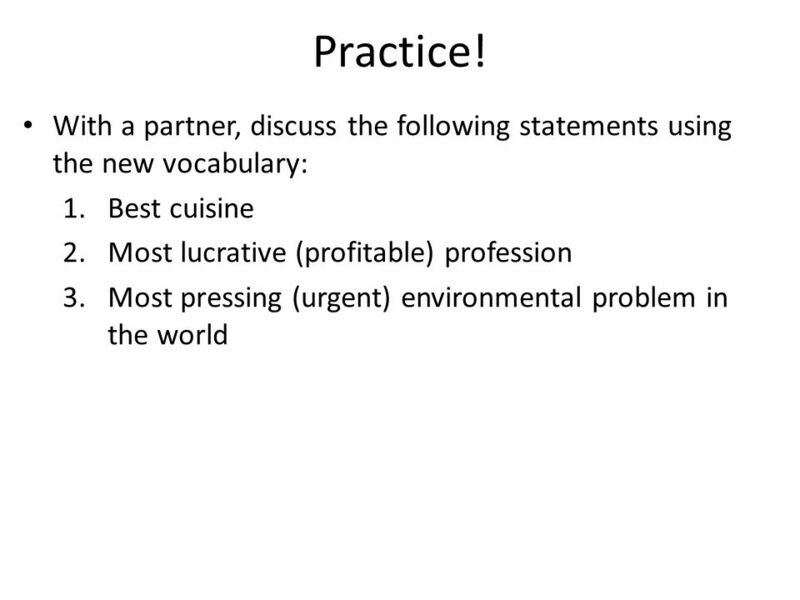 Example: A: It seems to me that global warming is a manmade problem and we must do something soon to solve it. B: Im afraid I have to disagree with you. There is evidence that shows the world is getting warmer naturally and people have nothing to do with it. 10 5. Asking for Clarification – I dont follow what you just said about… – Correct me if Im wrong, but are you saying that…? – Im sorry, but I didnt get your last point. Could you go over it again? – Would I be correct in saying that…? – Im not sure what youre getting at? – Im afraid Im not quite clear what you mean by that? – When you say…do you mean that…? – Am I correct in assuming that…? 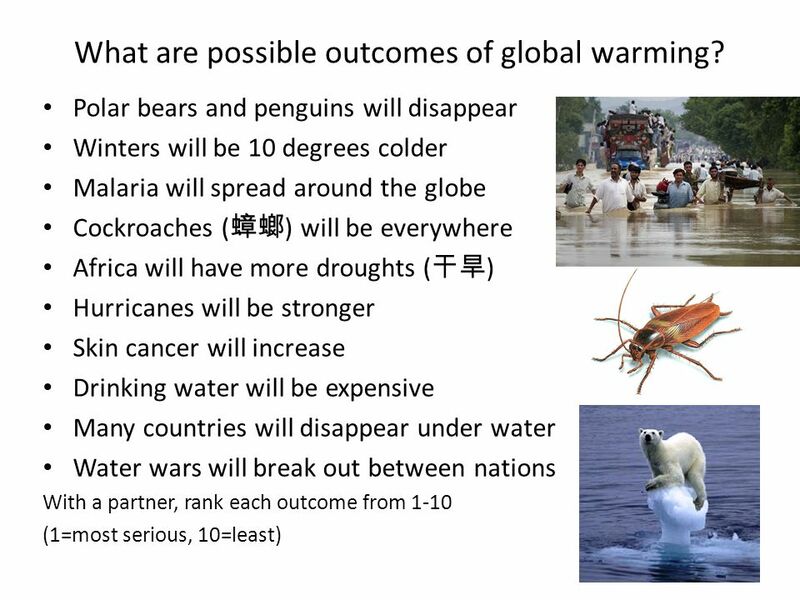 Example: A: It seems to me that global warming is a manmade problem and we must do something soon to solve it. B: By and large, I would accept your view, but there is evidence that suggests global warming is both manmade and part of a natural phenomenon. A:When you say its a natural phenomenon do you mean that humankinds increased output of greenhouse gasses has nothing to do with global warming? 11 6. Clarifying Your Position – Thats not exactly what I mean. – Basically, what Im trying to say is… – Perhaps I havent made myself clear. – Im afraid there seems to be a slight misunderstanding. – Let me put it another way. 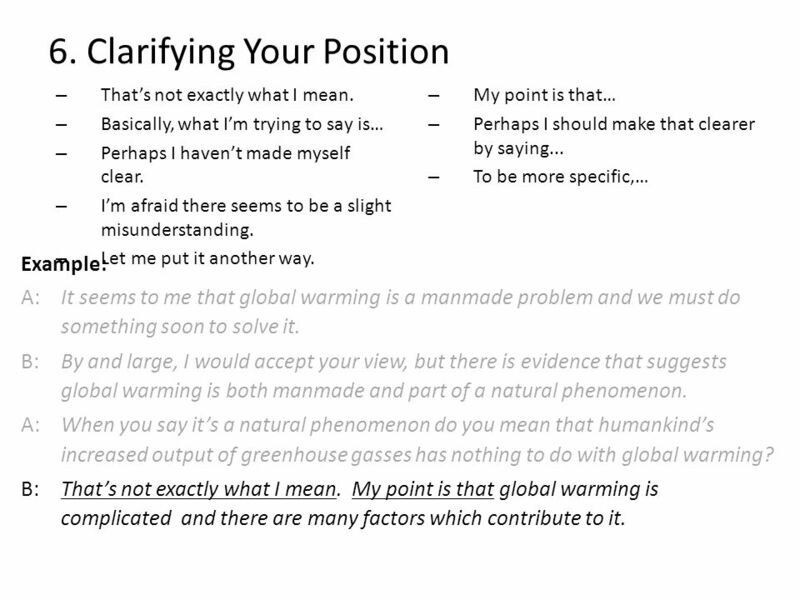 – My point is that… – Perhaps I should make that clearer by saying... – To be more specific,… Example: A: It seems to me that global warming is a manmade problem and we must do something soon to solve it. B: By and large, I would accept your view, but there is evidence that suggests global warming is both manmade and part of a natural phenomenon. A:When you say its a natural phenomenon do you mean that humankinds increased output of greenhouse gasses has nothing to do with global warming? B:Thats not exactly what I mean. My point is that global warming is complicated and there are many factors which contribute to it. 14 Practice! 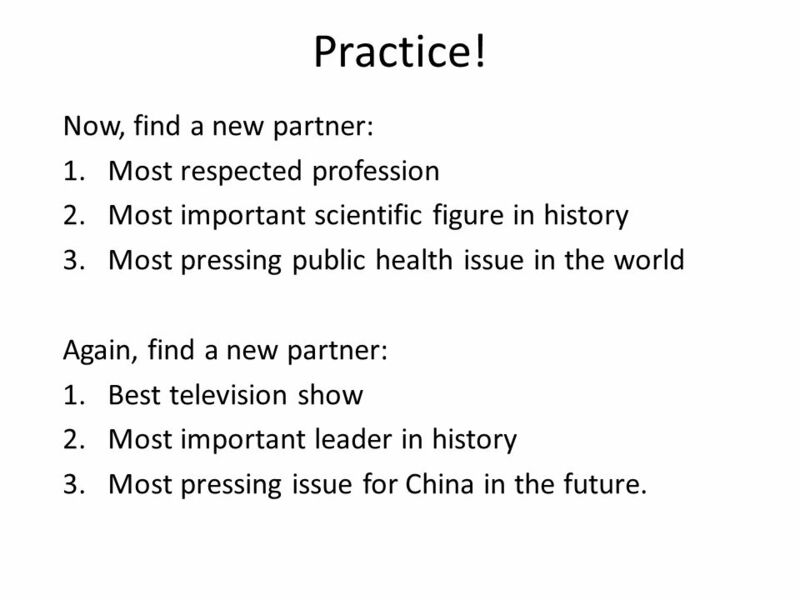 Now, find a new partner: 1.Most respected profession 2.Most important scientific figure in history 3.Most pressing public health issue in the world Again, find a new partner: 1.Best television show 2.Most important leader in history 3.Most pressing issue for China in the future. 15 Thursday: Class Debate! 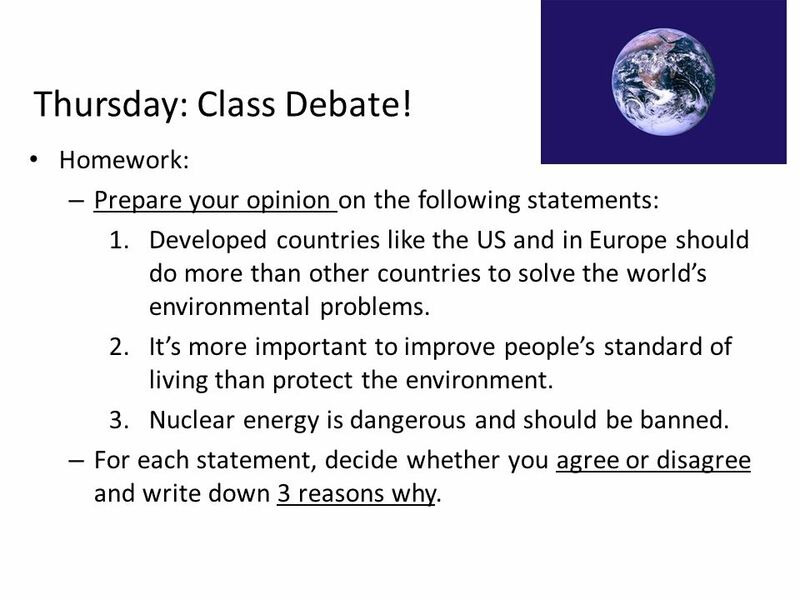 Homework: – Prepare your opinion on the following statements: 1.Developed countries like the US and in Europe should do more than other countries to solve the worlds environmental problems. 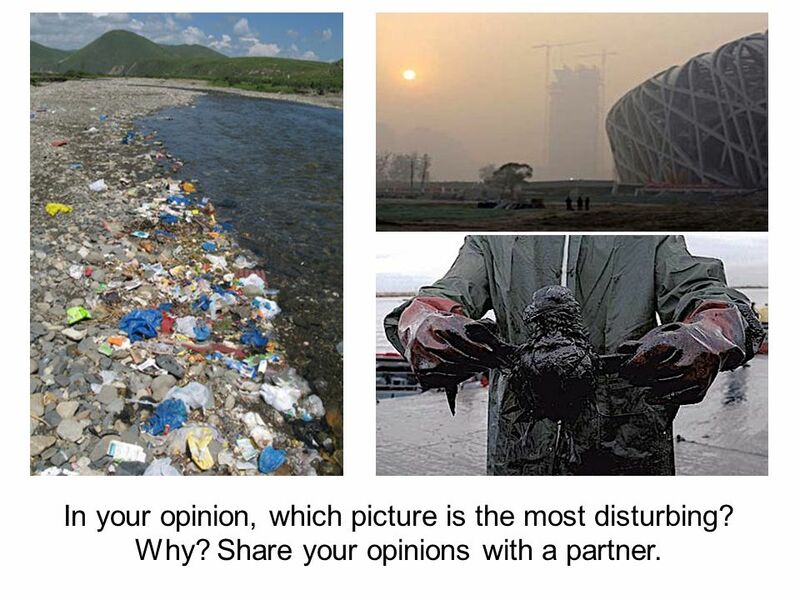 2.Its more important to improve peoples standard of living than protect the environment. 3.Nuclear energy is dangerous and should be banned. 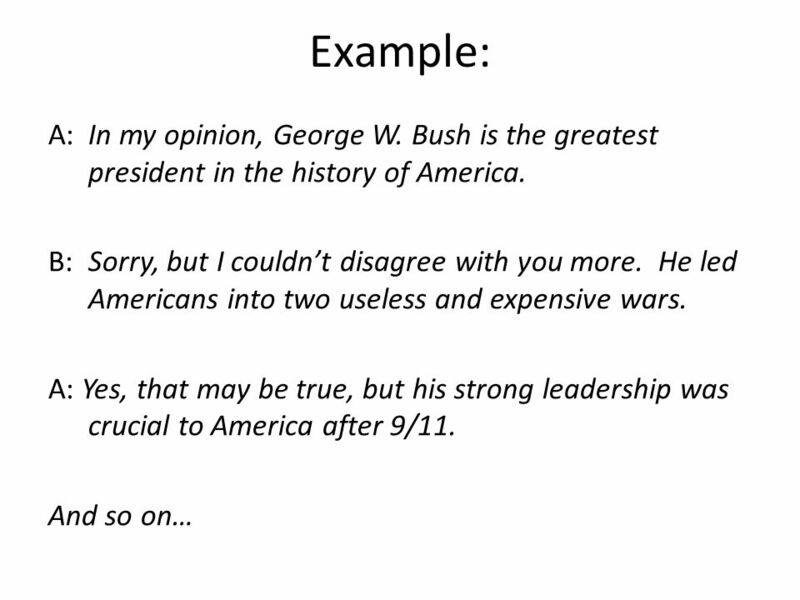 – For each statement, decide whether you agree or disagree and write down 3 reasons why. 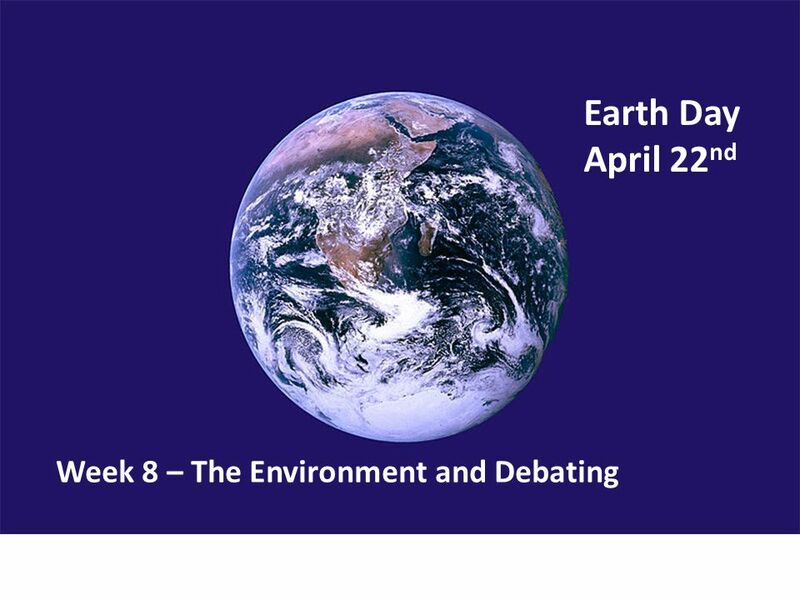 Download ppt "Earth Day April 22 nd Week 8 – The Environment and Debating." Local Alcohol School of 1 st module (10 meetings, once a week for 10 weeks) First meeting Introduce yourself: it is a polite way to begin working together. Global warming Made by Garegin Azizyan Form 8 B School № 5 Orenburg Russia. 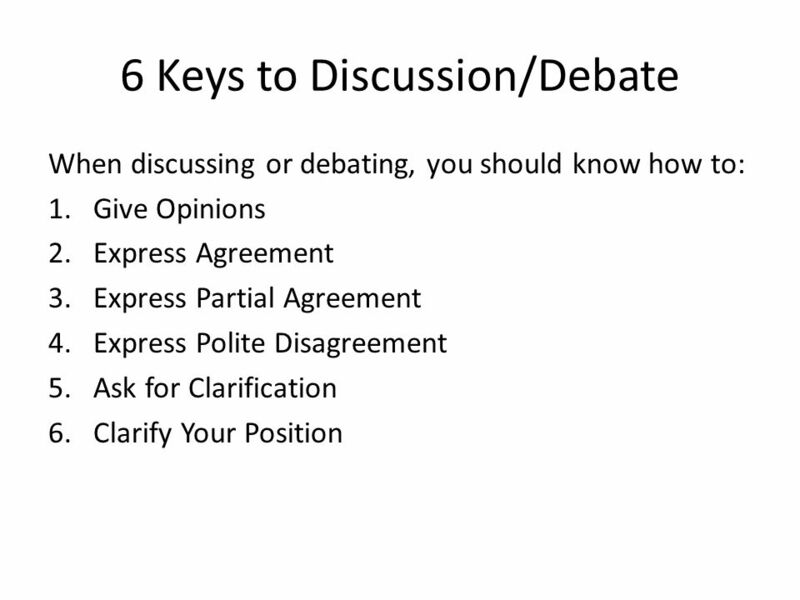 Discussion Skills For the 2nd semester. 1 Group participation Guidelines Observe and analyze the culture of the environment 2. Listen and prepare to respond 3. Use appropriate strategies. GROWING TOWARDS BEING A WRITER Thesis Statements and Essay Structure. Chunyan Shao.  Argument: some agree, some disagree, what is your opinion on that? ---Resort to evidence and reasoning  Persuasion: giving suggestions. Useful Expressions for Meeting & Negotiation Group 1 TiffanyTina LindaJodie JennyDaphne. Clarification. 1. Preparing a clear presentation Work on the 10-line presentation of your research Note down the place of stress Check the pronunciation.